BorisTheEngineer has created a pose editing program - no fancy 3D software needed! The program gives you the avi's skeleton and allows you to manipulate the bones, then you can export it as an .xaf file to use in the previewer. You can add poses to furniture or create triggered poses. Use the up/down arrow keys to select the bone you want to move. Bones are moved using six key pairs - Q and A, W and S, E and D, R and F, T and G, Y and H. The different keys rotate the bone on a different axis. Use left/right arrow keys to rotate the skeleton. To zoom in on the hands to make finger manipulation easier, press Z. (Hit Z again to go back to normal view). To save the pose just hit enter to bring up the Save dialogue box. Note that when you save your pose, the default filename will be test.xaf, so to prevent any poses being overwritten make sure you give your pose a new name. Also make sure that you have the .xaf extension there, because it won't automatically add it when it saves. There is no "undo" or "reset" function in the program, to start from scratch again you need to close and reopen the program. Or, you can save the "base" pose so that you can reload it again. (Hit L to load a saved pose). So far I've just been playing with triggered poses. To create a triggered pose, derive from a product such as this one, which is all ready for adding poses (this product is great to use as it is cheap, it will make poses that are male/female compatible, plus it shouldn't clash with any other products). Go to the Actions tab in the previewer. Note that there are two boxes under this panel, blue and red. To add a new pose, click add on the left side of the blue box. Now, to put your pose file in, click browse under Skeletal animation in the red box, find your .xaf file and click ok. You'll need to enter a trigger word - this is what you type in the client to make the pose work. Type your trigger in under Action parameters in the blue box, where it says Trigger. Now, your pose file that is created in the program only lasts for about a second. So to make it last longer you'll need to loop it. Add a value under Frame controls in the Skeletal animation section of the red box, where it says # loops. To stop your pose from moving with the avis idle movements, select Replace from the Composition dropdown menu. To make the avi morph smoothly to the pose rather than just jumping to it, you'll need to add blend in and out values too. If you want to add more poses, click Add in the blue box and add another pose in the same way as above. Once you get the hang of manipulating the bones the Pose Editor is quite easy to work with. You can instantly export your poses to the previewer to see how they look, so you can easily check every change you make. I'm not sure if there is another way to do it, but what I've done is basically just morphing between poses. You basically work in the same way as if making a pose, but you add multiple poses, or ensembles to one action. First, derive from a pose-ready product such as this one. Then go to the Actions tab. Add your action and give it a trigger word. 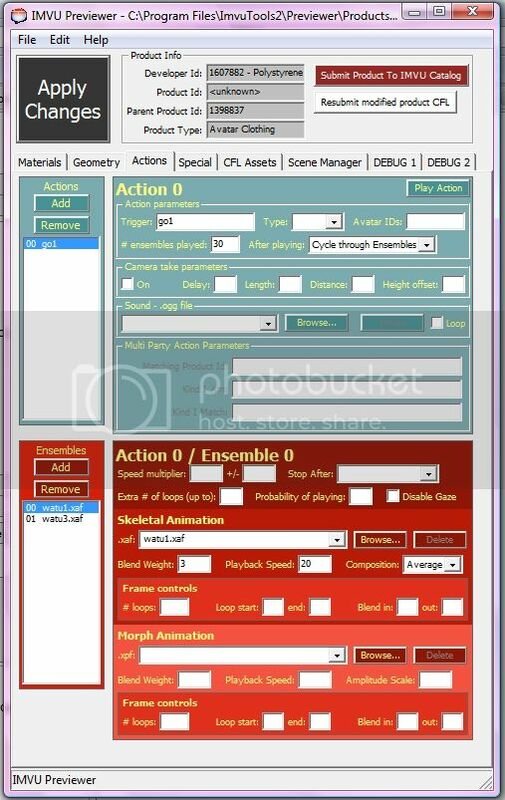 From the drop down menu in the blue box where it says After Playing, choose Cycle through Ensembles. This makes the animation cycle through each "pose" in the set. Next, working in the red box, you add ensembles for each pose in the animation. Put your .xaf files in under each ensemble, where it says Skeletal Animation. For the animation to morph smoothly between poses, the composition must be set to Average. The problem with this though, is that the pose will change a bit depending on the avi's idle movements, but I couldn't find a way of getting around it. You can adjust the speed of the animation by putting a value into Playback Speed (low value for slow, higher value for faster). Humm and actually I'm not sure what Blend Weight does or why I have a value there in my example lol. Make sure you set your composition and speed for all ensembles. The speed doesn't have to be the same for all ensembles - you may want your avi to pause for a little longer in a particular pose. To adjust the length of your animation, put a value in where it says # ensembles played (in the blue box). This value is for the total number of ensembles you want to be played - for example, my animation has 2 ensembles and I set that value to 30. This means that the animation plays through my ensembles 30 times in total (not 30 times for each ensemble), ie, my animation has 30 movements. Woot! Way to go Poly! This will be very helpfull for people who want to do poses but can't afford 3DS Max. Not much easier in Max...finger manipulation is time consuming, tedious and a pain. LOL I'm sure you'll get the hang of it. Its not a bug...its a "feature". Seriously, though - I think this will be a blast when I get the hang of the bone manipulation. You're such a clever lady. I have no idea how I double posted... sorry. Where and what is the composition dropdown menu? And lilcleverchic - look at my images in my examples, Composition is in the red box, under the section for Skeletal animation, just below the Browse and Delete buttons. If you set the composition to average the pose will change depending on the avi's idle poses, but if you set it to replace then it gets rid of the idle movements, totally replacing them with your pose. When i "Exported" my tester pose, it went onto my desktop, But how do i get it into my previewer please, I tryed opening it up in the previer, But didnt work? Umm basically just follow what I said before Go to the Actions tab, click Add, then in the red box in the action panel, where it says Skeletal Animation click browse, then find your .xaf file and click OK. Make sure you have a trigger word typed it or it won't work. Hit Apply Changes then click the button that says Play Action to see how your action looks.